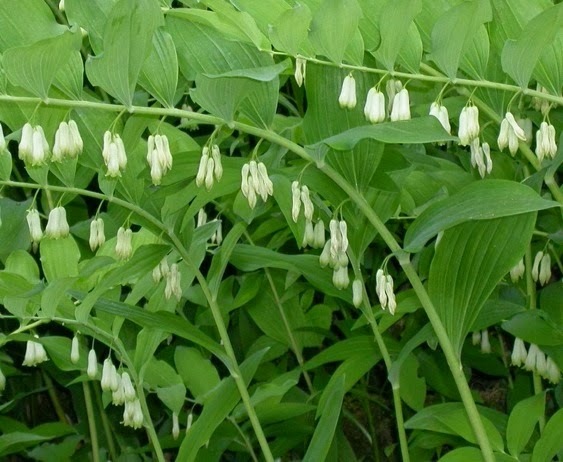 Die Siggelwatzel (English: Solomon's Seal; taxonomic: Polygonatum multiflorum) is a plant that is occasionally seen in the woods in the Deitscherei, but many people are unaware of the long history of this plant and its power to heal in the present. The plant is native to Europe, parts of Asia, and North America. Disclaimer: This information is for educational and discussion purposes only. Nothing in these posts is intended to constitute, or should be considered, medical advice or to serve as a substitute for the advice of a physician or other qualified health care provider. The aerial parts of Solomon's Seal can be toxic when consumed internally. Please consult with a licensed medical professional. The primary part used is the rhizome, or the root. In fact, all aerial part, especially the berries, are toxic and should not be used internally without the supervision of a licensed medical professional. The Penobscots using the rhizome (Chevallier, Andrew. Encyclopedia of herbal medicine, p. 252. New York: Dorling and Kindersley, 2000.) to treat gonorrhea (der Somefluss), and there is some evidence of such uses among the Deitsch. There is also evidence of Siggelwatzel being used in the treatment of croup (der Schtickfluss), sore throat (es Halsweh), and other chest ailments. However, these are internal remedies and are not commonly used in contemporary Blanzeheilkunscht. The most common use for Siggelwatzel in Deitsch herbalism today is for nerve pain (es Naerfeweh), a bruise (die Schrunn), or tendonitis (es Flexweh), and the primary method of application is by poultice (Packing) or salve (Schmier). The ethics of Blanzeheilkunscht are the same as those of all aspects of Braucherei when it comes to taking from the Plant kingdom. Never take the smallest, the largest, or the first one you see. Ethics of Blanzeschwetze command that the collector must make his/her need of the plant known, whether verbally or through meditative state and to ask permission of the plant to take from it. This is particularly important when digging roots or rhizomes because the potential for the plant to lose its life (rather than suffering a division) is increased. When a poultice is being utilized, the root is often collected fresh from the ground as needed. The dried herb may also be collected and stored for moistening (or infusion) and later application as a poultice. The rhizome of Siggelwatzel is typically (but not always) collected in mid-autumn (late October or November) and allowed to dry prior to being chopped up and stored. When the poultice is needed, the herb (fresh or moistened dried herb) is applied directly to the inflamed site and secured by bandages. The poultice remains in place for about 30-60 minutes. A fresh poultice are typically used in these circumstances three to five times per day. While poultices are an effective way to apply an herb full strength, they can also be messy and difficult to use given the busy lifestyle of most Deitsch folks today. Thus, many folks find it easier to make and to apply a salve of the root. Once the salve is made, it may be applied liberally to the site of bruising, nerve pain, or to aching tendons (Flex) and ligaments (Gliederband). According to Chevallier (252), "the rhizome has astringent and demulcent actions that undoubtedly contribute to its ability to accelerate healing" and tissue repair. I am currently using the salve on my elbow, where my tendon has experienced a workplace strain. I have noticed an improvement over three days. From prior experience, I know it takes several days of regular application for the pain to reduce, and the trick is to keep from straining the tendon again during the time of application. I can, though, from that prior experience, vouch for the efficacy of this herb. Despite the English language's association of this plant with the Israeli King Solomon, this plant has a discernible watery feminine energy in Blanzeschwetze. It should be approached with the same respect that one would approach a stately family matron. When approached in proper context, including statement of purpose, I have found that Siggelwatzel readily will grant permission to use the root. Again, though, please follow the ethics of rhizome collection as described above. There is another plant in my area called False Solomon's Seal. Does it have similar uses? Sherri, I almost commented on False Solomon's Seal in the blog post because it is more commonly seen in the wild than Solomon's Seal. It is closely related to the Polygonatum family of Solomon's Seal and to the Spikenards, so it has quite a few of the same properties. However, False Solomon's Seal seems to be share the aspect against coughs and depressed emotional states but not so much the connective tissue repair aspect of Solomon's Seal. The aerial parts of False Solomon's Seal are also not as toxic as those of Solomon's Seal and some people eat the young shoots, so I know more people who take False Solomon's Seal internally. It can, though, have a laxative effect, so it should only be consumed in moderation.